So this past Saturday, I was ITCHING to do something crafty. I was actually having crafting withdrawls... 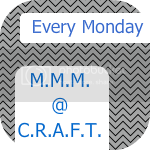 I hadn't made something in such a LONG TIME. However, I didn't feel like going out to buy any supplies I might need to make something, so I had to work with what I had. 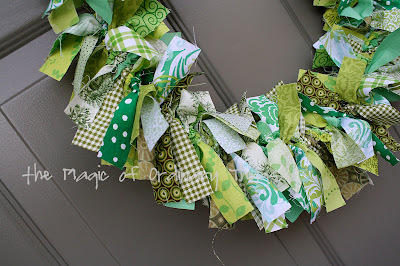 I've been wanting to make a rag wreath since last fall, when I really starting following all of these crafty blogs. So I got out my fabric scrap bin, and was amazed at how much green fabric I had left over from all the purses I made last summer - Green is my favorite color, but I didn't realize I had used so much of it when making all those purses. Since St. Patrick's Day is right around the corner - Green was the perfect color. I used a wire hanger that I shaped into a circle for the wreath form. It ended up being about a 12" diameter. I think there are about 15 different patterns - only one being a solid. I love the combination of all the different shades - from kelly to olive to chartruese, and everything in between. I Love it and think it looks really good on my newly painted front door. 2012 Update: A little tutorial - like stated above, I used a wire hanger for the form. I snipped off the hook part of the hanger and then using pliers, I straightened it the best I could and then shaped it into a 12" diameter circle. I then held the ends together with duct tape. The fabric strips are 1" x 6", which I cut with a rotary tool. Then I tied them all to the wire. There are probably 150 strips. I have no idea how much fabric I used because it was all scrap. LOVE IT!!! 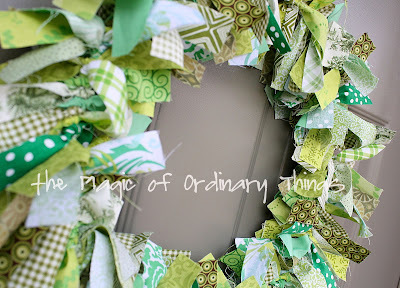 I love rag wreaths but this one is particularly cute. Great job! This is such a good idea! 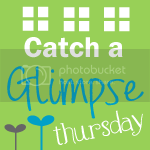 I saw your post on "A Glimpse Inside" and now I'm a follower of your blog! Wow, you have great scraps laying around. So cute!!! Saw you in Glimpse inside party. Love it! Love it! So cute and perfect for St. Patty's day! This turned out lovely. I love all the shades of green, and that you repurposed a wire hanger. Visiting via the weekend wrap up. SO cute! :) Nice work! Your wreath is beautiful. I love all the different patterns! Very pretty! The variations of green truly make this gorgeous! You did a fantastic job! This is too cute! I want to re-create it!!! Great idea! This wreath is so cute! I hope you'll link it up at I Heart Nap Time. I love it! Perfect colors! Cute, Cute! Very cute! This will look great on your door all of spring. This looks great! I love these rag wreaths. I love that I can make this with a plain old wire hanger... just wish I had scraps of green!! 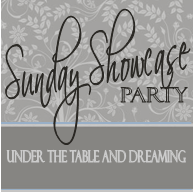 Loved this so much I featured it...please stop by, check it out, and grab my button. so cute. I think this is the prettiest st patty's wreath out there. Love this. It's so fun! Love this! I just made my first rag wreath yesterday! Hi, I just came across your blog. This is such a cute idea! I love it. I was wondering... how long and wide did you make each piece of fabric? I don't think i'll have time to make one before st. patty's day this week, but hopefully for some other holiday this year. Thanks for sharing! Love this! I have bits and pieces of a yellow and burlap fabric wreath all over my craft room that I have been working on for a month now...lol. I want to make one! Is it just fabric knotted around a wreath? I actually would like to know what shade you painted your front door! I love the color! I made my own version of this after being inspired by yours! I wired together three round, plastic plant supports (you know...the kind that come with spring bulbs) so they would look like a shamrock. Then, I tied my fabric scraps to them. I did have to buy the fabric (1 yd. ea. of 3 coordinating fabrics). But I could probably make 2-3 more wreaths from those 3 yds. Therefore, this project cost me a total of about $5!!! Thanks for the inspiration!!! I love rag wreathes! This turned out great. I hope you will link up to my St. Patty's Day Project Parade. What paint color is the door? We are getting ready to paint ours and I love this color! Thanks so much! K. Thomas... that paint color for the door was a custom color made to match our deck stain, which I have no idea what color that was. Thanks for liking it, but sorry I can't help you. This is adorable! My mom used to do this with elastic hair rubber bands and fabric to make cute scrunchies! Your wreath is really cute! I will have to try making one. Thanks for having such a cool post to share! 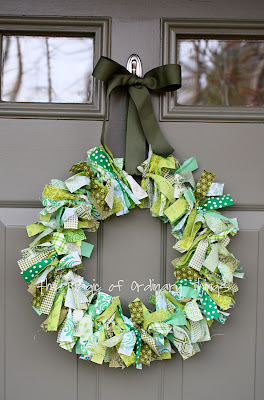 absolutely love your Green Wreath! However, as an Irishwoman I must correct you - no one, not one single person, ever, would say St "Patty's" day!!!!!! Theres no such a thing!!!! !